God's Own qualifies for the Arkle, as his Punchestown win was after the UK season finished. He's 8/1 for it at Paddy Power ! A shock Grade One winner at the Punchestown Festival in May, Tom George's charge was sent off an 8-1 shot for this Grade Two event, with 2012 winner, Cue Card, the 13-8 favourite. However, the market leader proved no match for the impressive winner as God's Own kicked on from the last and Paddy Brennan pushed five lengths clear of Balder Succes, who made a costly blunder at the third-last, with the pacesetting Oscar Hill pipping Cue Card for third. George said: "I think it's on the cards that we'll go back to the novice route and keep him to right-handed courses. He has won going left-handed over hurdles, but until we think it's the right time he'll stick to what suits him best. "There's no point going into handicaps off his mark. "I'm delighted for Paddy who has gone close a couple of times in this, only for everything to come right today. 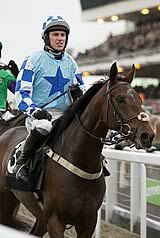 "We never had any doubt (about the Punchestown run). He's improved again over the summer and he's obviously progressing. He's a horse that goes well fresh." 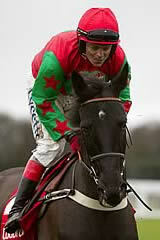 Alan King will keep Balder Succes to the minimum distance, believing that speed is his charge's greatest weapon. The Barbury Castle trainer said: "Although his mistake at the third-last didn't help, he travelled well and stayed on all the way to the line. I want to stay on the two-mile route and head for the Tingle Creek to see if he is a proper two-miler." Colin Tizzard reported that fourth-home Cue Card would now have his attention turned to the Betfair Chase at Haydock. He said: "We thought all along that he would be no better over two miles than he was last year, and that despite his racecourse gallop he would improve for the run. "Over two miles he was there to be shot at with specialist horses at this trip sat on his tail. I was satisfied with that, and we'll go to Haydock as planned."